Should games and play be considered important in designing instructional contexts? Should they be used for professional development, or even become a part of our productivity at work? Games offer individuals a learning environment rich with choice and feedback . . . not only for gathering information about a student’s learning, but that also demand mastery in recall, comprehension, and problem solving. The difficulty with games may be our view that games are a form of play, an undirected, frivolous children’s activity . In this presentation research and examples of games and play inspired activities will be presented for motivating learners, designing effective instruction, improving comprehension and problem solving, providing therapeutic interventions, aiding in work-place productivity, and professional development. What we cannot know or do individually, we may be capable of collectively. My research examines the transformation of perceptual knowledge into conceptual knowledge. Conceptual knowledge can be viewed as crystallized, which means that it has become abstracted and is often symbolized in ways that do not make the associated meaning obvious. Crystallized knowledge is the outcome of fluid intelligence, or the ability to think logically and solve problems in novel situations, independent of acquired knowledge. I investigate how groups and objects may assist in crystallization of knowledge, or the construction of conceptual understanding. I am currently approaching this problem from the perspective that cognition is externalized and extended through objects and relationships. Â This view posits that skill, competence, knowledge are learned through interaction aided with objects imbued with collective knowledge. Groups make specialized information available through objects and relationships so that individual members can coordinate their actions and do things that would be hard or impossible for them to enact individually.Â To examine this, I use a socio-cognitive approach, which views cognition as distributed, where information processing is imbued in objects and communities and aids learners in problem solving. Games hold communal knowledge, which can be learned through game play. An example of this comes from the board game Ticket to Ride. In this strategy game players take on the role of a railroad tycoon in the early 1900â€²s. The goal is to build an empire that spans the United States while making shrewd moves that block your opponents from being able to complete their freight and passenger runs to various cities. Game play scaffolds the learner in the history and implications of early transportation through taking on the role of an entrepreneur and learning the context and process of building up a railroad empire. In the course of the game, concept are introduced, with language, and value systems based upon the problem space created by the game mechanics (artifacts, scoring, rules, and language). The game can be analyzed as a cultural artifact containing historical information; a vehicle for content delivery as a curriculum tool; as well as an intervention for studying player knowledge and decision-making. Trial and error â€“ forming a mental representation, or situation model of how the roles, rules, tools, and contexts work for problem solving. Tactical trials â€“ a successful tactic is generated to solve problems using the tools, rules, roles, and contexts.Â This tactic may be modified for use in a variety of ways as goals and context change in the game play. Strategiesâ€”the range of tactics of resulted in strategies that come from a theory of how the game works. This approach to problem solving indicates a growing awareness of systems knowledge, the purpose or criteria for winning, and is a step towards top sight. They understand that there are decision branches, and each decision branch comes with risk reward they can evaluate in the context of economizing resources. Layered strategiesâ€”the player is now making choices based upon managing resources because they are now economizing resources and playing for optimal success with a well-developed mental representation of the games criteria for winning, and how to have a high score rather than just finish. Aesthetic of playâ€”the player understands the system and has learned to use and exploit ambiguities in the rules and environment to play with an aesthetic that sets the player apart from others. The game play is characterized with surprising solutions to the problem space. For me, games are a structured form of play. As an example, a game may playfully represent an action with associated knowledge, such as becoming a railroad tycoon, driving a high performance racecar, or even raising a family. Games always involve contingent decision-making, forcing the players to learn and interact with cultural knowledge simulated in the game. A single individual can use a map to navigate an area with competence, if not expertise. Observing an individual learning to use a map, or even construct one is instructive for learning about comprehension and decision-making. Interestingly, games provide structure to play, just as maps and media appliances provide structure to data to create information. Objects such as maps and games are examples of collective knowledge, and are what Vygotsky termed a pivot. The term pivot was initially conceptualized in describing childrenâ€™s play, particularly as a toy. A toy is a representation used in aiding knowledge construction in early childhood development. 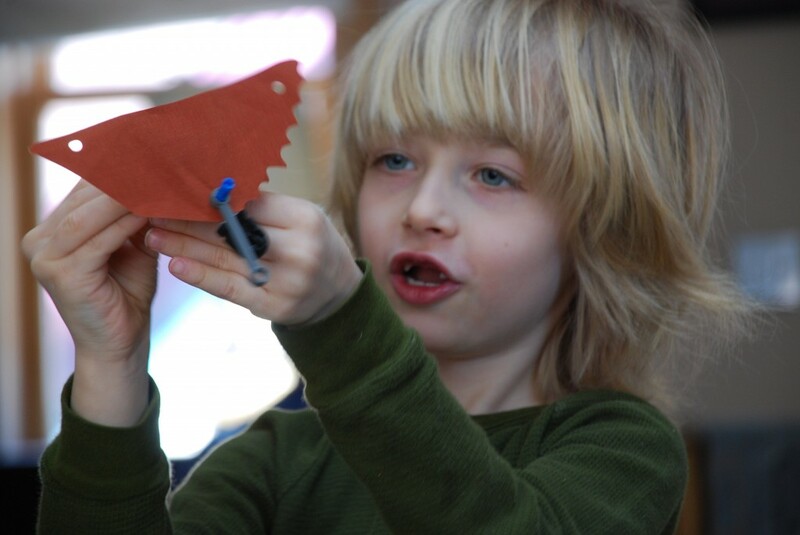 This is the transition where children may move from recognitive play to symbolic and imaginative play, i.e. the child may play with a phone the way it is supposed to be used to show they can use it (recognitive), and in symbolic or imaginative play, they may pretend a banana is the phone. This is an important step since representation and abstraction are essential in learning language, especially print and alphabetical systems for reading and other discourse. In this sense, play provides a transitional stage in this direction whenever an object (for example a stick) becomes a pivot for severing meaning of horse from a real horse. The child cannot yet detach thought from object. (Vygotsky, 1976, p 97). For Vygotsky, play represented a transition in comprehension and problem solving â€“where the child moved from external processing — imagination in action —to internal processing — imagination as play without action. In my own work, I have studied the play of school children and adults as learning activities. This research has informed my work in classroom instruction and game design. Learning activities can be structured as a game, extending the opportunity to learn content, and extend the context of the game into other aspects of the learnerâ€™s life, providing performance data and allowing for self-improvement with feedback, and data collection that is assessed, measured and evaluated for policy. My research and publications have been informed by my work as a tenured teacher and software developer. A key feature of my work is the importance of designing for learning transfer and construct validity. When I design a learning environment, I do so with research in mind. Action research allows for reflection and analysis of what I created, what the learners experienced, and an opportunity to build theory. What is unique about what I do is the systems approach and the way I reverse engineer play as a deep and effective learning tool into transformative learning, where pleasurable activities can be counted as learning. Although I have published using a wide variety of methodologies, cognitive ethnography is a methodology typically associated with distributed cognition, and examines how communities contain varying levels of competence and expertise, and how they may imbue that knowledge in objects. I have used it specifically on game and play analysis (Dubbels 2008, 2011). This involves observation and analysis of Space or Contextâ€”specifically conceptual space, physical space, and social space. The cognitive ethnographer transforms observational data and interpretation of space into meaningful representations so that cognitive properties of the system become visible (Hutchins, 2010; 1995). Cognitive ethnography seeks to understand cognitive process and contextâ€”examining them together, thus, eliminating the false dichotomy between psychology and anthropology. This can be very effective for building theories of learning while being accessible to educators. My current interest is in the use of cognitive ethnographic methodology with traditional form serves as an opportunity to move between inductive and deductive inquiry and observation to build a Nomological network (Cronbach & Meehl, 1955) using measures and quantified observations with the Multiple Trait and Multiple Method Matrix Analysis (Campbell & Fiske, 1959) for construct validity (Cook & Campbell, 1979; Campbell & Stanley, 1966) especially in relation to comprehension and problem solving based upon the Event Indexing Model (Zwaan & Radvansky, 1998). We distribute knowledge because it is impossible for a single human being, or even a group to have mastery of all knowledge and all skills (Levy, 1997). For this reason I study access and quality of collective group relations and objects and the resulting comprehension and problem solving. The use of these objects and relations can scaffold learners and inform our understanding of how perceptual knowledge is internalized and transformed into conceptual knowledge through learning and experience. Educational research in cognitive psychology, social learning. identity, curriculum and instruction, game design, theories of play and learning, assessment, instructional design, and technology innovation. The ability to create of media communication through narrative, image, and data analysis and information graphics is becoming more accessible to non-experts through media appliances such as phones, tablets, game consoles and personal computers. These media appliances have taken very complex behaviors such as film production, which in the past required teams of people with special skill and knowledge, and have imbued these skills and knowledge in hand-held devices that are easy to use, and are available to the general population. This accessibility allows novices to learn complex media production, analysis, and broadcast, and allows for the study of these devices as object that has been imbued with the knowledge and skill, as externalized cognitionThrough the use of these devices, the general population may learn complex skills and knowledge that may have required years of specialized training in the past. Study of the interaction between of individuals learning to use these appliances and devices can be studied as a progression of internalizing knowledge and skill imbued in objects. The convergence of media technologies into small, single–even handheldâ€”devices emphasizes that technology for producing media may change, but the narrative has remained relatively consistent. This consistency of media as narrative, imagery, and data analysis emphasizes the importance of the continued study of narrative comprehension and problem solving through the use of these media appliances. Gamefication? Or is it Gamefuscation? Is there evidence that game-based learning leads to far transfer? Without learning transfer, it doesn’t matter how a person learned–whether from a piece of software, watching an expert, rote memorization, or the back of cereal box. What is important is that learning occurred, and how we know that learning occurred. This leads to issues of assessment and evaluation. Transfer and Games:Â How do we assess this? The typical response from gameficators is that assessment does not measure the complex learning from games. I have been there and said that. Â But I have learned that is overly dismissive of assessment and utterly simplistic. As I investigated assessment and psychometrics, I have learned how simplistic were my statements. 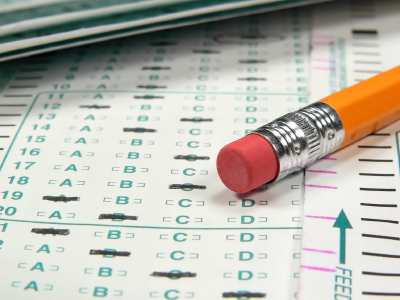 Games themselves are assessment tools, and I learned that by learning about assessment. This Gameficator–(yes I am now going to 3rd person)–had to seek knowledge beyond his ludic and narratological powers. He had to learn the mysteries and great lore of psychometrics, instructional design, and educational psychology. It was through this journey into the dark arts, that he has been able to overcome some of the traps of Captain Obvious, and his insidious powers to sidetrack and obfuscate through jargonification,and worse–like taking credit for previously documented phenomena by imposing a new name. . . kind of like my renaming Canada to the now improved, muchmorebetter name: Candyland. In reality, I had to learn the language and content domain of learning to be an effective instructional designer, just as children learn the language and content domains of science, literature, math, and civics. What I have learned through my journey, is that if a learner cannot explain a concept, that this inability to explain and demonstrate may be an indicator that the learning from the game experience is not crystallized–that the learner does not have a conceptual understanding that can be explained or expressed by that learner. Does gamefied learning deliver this? Gameficators need to address this if this is to be more than a captivating trend. I am fearful that the good that comes from this trend will not matter if we are only creating Â jargonification (even if it is moreÂ accessible). It is not enough to redescribe an established instructional design technique if we cannot demonstrate its effectiveness. Â We should be asking how learning in game-like contexts enhances learning and how to measure that. Measurement and testing are important because well-designed tests and measures can deliver an assessment of crystallized knowledge–does the learner have a chunked conceptual understanding of a concept, such as “resistance”, “average”, “setting”? Sure, students may have a gist understanding of a concept. The teacher may even see this qualitatively, but the student cannot express it in a test. So is that comprehension? I think not. The point of the test is an un-scaffolded demonstration of comprehension. Maybe the game player has demonstrated the concept of “resistance” in a game by choosing a boat with less resistance to go faster in the game space– but this is not evidence that they understand the term conceptually. This example from a game may be an important aspect of perceptual learning, that may lead to the eventual ability to explain (conceptual learning); but it is not evidence of comprehension of “resistance” as a concept. So when we look at game based learning, we should be asking what it does best, not whether it is better.Â Games can become a type of assessment where contextual knowledge is demonstrated. But we need to go beyond perceptual knowledge–reacting correctly in context and across contexts–to conceptual knowledge: the ability to explain and demonstrate a concept. My feeling is that one should be skeptical of Gameficators that pontificate without pointing to the traditions in educational research. If Gamefication advocates want to influence education and assessment, they should attempt to learn the history, and provide evidential differences from the established terms they seek Â to replace. Another concern I have is that Â perhaps not all gameficators are created equal. Maybe some gameficators are not really advocatingfor the game elements that are really fundamental aspects of games? Maybe there are people with no ludic-narratological powers donning the cape of gamefication! I must ask, is this leaderboard what makes for “gameness”? Or does a completion task-bar make for gamey experience? Does this leaderboard for shoe preference tell us anything but shoe preference? Where is the game? Are there some hidden game mechanics that I am failing to apprehend? some of the elements of gamefication rely heavily on aspects of games that are not new, just rebranded. some of the elements of gamefication aren’t really “gamey”. What I like about games is thatÂ games can provide multimodal experiences, and provide context and prior knowledge without the interference of years of practice-this is new. Games accelerate learning by reducing the some of the gatekeeping issues. Now a person without the strength, dexterity and madness can share in some of the experience of riding skateboard off a ramp. Â The benefit of games may be in the increased richness of a virtual interactive experience, Â and provide the immediate task competencies without the time required to become competent. Games provide a protocol, expedite, and scalffold players toward a fidelity of conceptual experience. For example, in RIDE, the player is immediately able to do tricks that require many years of practice because the game exaggerates the fidelity of experience. Â This cuts the time it might take to develop conceptual knowledge but reducing the the necessity of coordination, balance, dexterity and insanity to ride a skateboard up a ramp and do a trick in the air and then land unscathed. Gameficators might embrace this notion. Games can enhance learning in a classroom, and enhance what is already called experiential learning. words, terms, concepts, and domain praxis matter. Games can help structure problems. But do they help learners understand how to structure a problem. Do they deliver conceptualized knowledge? Common vocabulary indicative of a content domain? The issue is really about What Games are Good at Doing, not whether they are better than some other traditional form of instruction. or, a correct but non-applicable answer such as “an unwillingness to comply”. The key is that the student can express the expected knowledge of the content domain in relation to the word. This is often what we test for. So how do games lead to this outcome? I am not hear to give gameficators a hard time–I have a gamefication badge (self-created)–but I would like to know that when my learning is gamefied that the gameficator had some knowledge from the last century of instructional design and learning research, just as I want my physics student to know that resistance as an operationalized concept in science, not a popular cultural saying from the BORG. perhaps explore the big ideas and lessons that come from years educational psychology research, rather than just renaming and creating new platform without realizing or acknowledging, that current ideas in gamefication stand on the established shoulders of giants from a century of educational research. Jargonification is a big concern. So lets make our words matter and also look back as we look forward. Games are potentially powerful tools for learning, but not all may be effective in every purpose or context. What does the research say? I am hopeful gamefication delivers a closer look at how game-like instructional design may enhance successful learning. I don’t think anyone would disagree — fostering creativity should be a goal of classroom learning. However, the terms creativity and innovation are often misused. When used they typically imply that REAL learning cannot be measured. Fortunately, we know A LOT about learning and how it happens now. It is measurable and we can design learning environments that promote it. It is the same with creativity as withÂ intelligence–we can promote growth in creativity and intelligence throughÂ creative approaches toÂ pedagogy and assessment. Because data-driven instruction does not kill creativity, it should promote it. Fluid intelligence orÂ fluid reasoning is the capacity to think logically and solve problems in novel situations, independent of acquired knowledge. It is the ability to analyze novel problems, identify patterns and relationships that underpin these problems and the extrapolation of these using logic. It is necessary for all logical problem solving, especially scientific, mathematical and technical problem solving. Fluid reasoning includes inductive reasoning and deductive reasoning, and is predictive of creativity and innovation. Crystallized intelligence is indicated by a person’s depth and breadth of general knowledge, vocabulary, and the ability to reason using words and numbers. It is the product of educational and cultural experience in interaction with fluid intelligence and also predicts creativity and innovation. Creativity and intelligence are not opposites. It takes both for innovation. What we often lack are creative ways of measuring learning growth in assessments. When we choose to measure growth in summative evaluations and worksheets over and over , we nurture boredom and kill creativity. To foster creativity, we need to adopt and implement pedagogy and curriculum that promotes creative problems solving, and also provides criteria that can measure creative problem solving. What is needed are ways to help students learn content in creative ways through the use of creative assessments. We often confuse the idea of Â learning creatively with trial and error and play, free of any kind of assessment–that somehow the Mona Lisa was created through just free play and doodling. That somehow assessment kills creativity. Â Assessment provideÂ learningÂ goals. Without learning criteria, students are left to make sense of the problem put before them with questions like “what do I do now?” (ad infinitum). But play and self-interest arte not the problem here. The problem is the way we are approaching assessment. Although play isÂ described as a range of voluntary, intrinsically motivated activities normally associated with recreational pleasure and enjoyment; Pleasure and enjoyment still come from judgements about one’s work–just like assessment–whether finger painting or creating a differential equation. The key feature here is that play seems to involve self-evaluation and discovery of key concepts and patterns. Assessments can be constructed to scaffold and extend this, and this same process can be structured in classrooms through assessment criteria. Waterline is an imaginary line circumscribing the hull that matches the surface of the water when the hull is not moving. Midships is the midpoint of the LWL (see below). It is half-way from the forwardmost point on the waterline to the rear-most point on the waterline. Along with the learning activity and targeted learning criteria and content, the student should be asked a guiding question to help structure their description. ï»¿So, how do these parts affect the performance of the whole? Additionally, the learner should be adopting the language (criteria) from the rubric to build comprehension. Taking perception, experience, similarities and contrasts to understand Bow and Stern, or even Beauty. What the tradition of intelligence offers is an insight as to how an educator might support students. What we know is that intelligence is not innate. It can change through learning opportunities. The goal of the teacher should be to provide experiential learning that extends Fluid Intelligence, through developing problem solving, and link this process to crystallized concepts in vocabulary terms that encapsulate complex process, ideas, and description. The real technology in a 21st Century Classroom is in the presentation and collection of information. It is the art of designing assessment for data-driven decision making. The role of the teacher should be in grounding crystallized academic concepts in experiential learning with assessments the provide structure for creative problem solving. The teacher creates assessments where the learning is the assessment. The learner is scaffolded through the activity with guidance of assessment criteria. A rubric, which provides criteria for quality and excellence can scaffold creativity innovation, and content learning simultaneously. A well-conceived assessment guides students to understand descriptions of quality and help students to understand crystallized concepts. Level up Has identified event and hull design with reasoning for appropriateness. Has drawn a sketch where length, width, and height are represented by lines 120 degrees apart, with all measurements in the same scale. Understanding is clear from the use of five key terms from the word wall to describe how and why the boat hull design will be successful for the chosen event. Clear connection between the hull design, event, sketch, and important terms from word wall and next steps for building a prototype and testing. Approaching Has chosen a hull that is appropriate for event but cannot connect the two. Has drawn Has drawn a sketch where length, width, and height are represented. Uses five key terms but struggles to demonstrate understanding of the terms in usage. Describes design elements, but cannot make the connection of how they work together. Do it again Has chosen a hull design but it may not be appropriate for the event. Has drawn a sketch but it does not have length, width, and height represented. Does not use five terms from word wall. Struggles to make a clear connection between design conceptual design stage elements. What is important about this rubric is that it guides the learner in understanding quality and assessment. It also familiarizes the learner with key crystallized concepts as part of the assessment descriptions. In order to be successful in this playful, experiential activity (boat building), Â the learner must learn to comprehend and demonstrate knowledge of the vocabulary scattered throughout the rubric such as: isometric, reasoning, etc. This connection to complex terminology grounded with experienceÂ is what builds knowledge and competence. When an educator can coach a student connecting their experiential learning with the assessment criteria, they construct crystallized intelligence through grounding the concept in experiential learning, and potentially expand fluid intelligence through awareness of new patterns in form and structure. Just because someone plays, or explores does not mean this learning is immeasurable. The truth is, research on creative breakthroughs demonstrate that authors of great innovation learned through years of dedicated practice and were often judged, assessed, and evaluated. Â This feedback from their teachers led them to new understanding and new heights. Great innovators often developed crystallized concepts that resulted from experience in developing fluid intelligence. This can come from copying the genius of others by replicating their breakthroughs; it comes from repetition and making basic skills automatic, so that they could explore the larger patternsÂ resultingÂ from their actions. It was the result of repetition and exploration, where they could reason, experiment, and experience without thinking about the mechanics of their actions. Â This meant learning the content and skills from the knowledge domain and developing some level of automaticity. What sets an innovator apart it seems, is tenacity and beingÂ playful in their work, and working hard at their play. During all those years of experimentation and research, I never once made a discovery. All my work was deductive, and the results I achieved were those of invention, pure and simple. I would construct a theory and work on its lines until I found it was untenable. Then it would be discarded at once and another theory evolved. This was the only possible way for me to work out the problem. … I speak without exaggeration when I say that I have constructed 3,000 different theories in connection with the electric light, each one of them reasonable and apparently likely to be true. Yet only in two cases did my experiments prove the truth of my theory. My chief difficulty was in constructing the carbon filament. . . . Every quarter of the globe was ransacked by my agents, and all sorts of the queerest materials used, until finally the shred of bamboo, now utilized by us, was settled upon. Everyone steals in commerce and industry. I have stolen a lot myself. But at least I know how to steal. Edison stole ideas from others,Â (just as Watson and Crick were accused of doing). The point Watson seems to be making here is that he knew how to steal, meaning, he saw how the parts fit together. He may have taken ideas from a variety of places, but he had the knowledge, skill, and vision to put them together. This synthesis of ideas took awareness of the problem, the outcome, and how things might work. Lots and lots of experience and practice. To attain this level of knowledge andÂ experience, perhaps stealing ideas, or copying and imitation are not a bad idea for classroom learning? However copying someone else in school is viewed as cheating rather than a starting point. Perhaps instead, we can take the criteria of examples and design classroom problems in ways thatÂ allowÂ discovery and the replication of prior findings (the basis of scientific laws). It is often said that imitation is the greatest form of flattery. Imitation is also one of the ways we learn.Â In the tradition ofÂ play research,Â mimesis is imitation–Aristotle held that it was “simulated representation”. In close, my hope is that we not use the terms “creativity” and “innovation” as suitcase words to diminish such things as minimum standards. We need minimum standards. But when we talk about teaching for creativity and innovation, where we need to start is the way that we gather data for assessment. Often assessments are unimaginative in themselves. They are applied in ways that distract from learning, because they have become the learning. One of the worst outcomes of this practice is that students believe that they areÂ knowledgeable after passing a minimum standards test. This is the soft-bigotry of low expectation. Assessment should be adaptive, criteria driven, and modeled as a continuousÂ improvementÂ cycle. This does not mean that we must Â drill and kill kids in grinding mindless repetition. Kids will grind towards a larger goal where they are offered feedback on their progress. They do it in games. Games are structured forms of play. They are criteria driven, and by their very nature, games assess, measure, and evaluate. But they are only as good as their assessment criteria. How does the experience inform the concepts in the lesson? There is a way to use data-driven instruction in very creative lessons, just like the very unimaginative drill and kill approach. Teachers and assessment coordinators need to take the leap and learn to use data collection in creative ways in constructive assignments that promote experiential learning with crystallized academic concepts. If you have kids make a diorama of a story, have them use the concepts that are part of the standards and testing: Plot, Character, Theme, Setting, ETC. Make them demonstrate and explain. If you want kids to learn the physics have them make a boat and connect the terms through discovery. Use their inductive learning and guide them to conceptual understanding.This can be done through the use of informative assessments,Â such as with rubrics and scales for assessment. Â Evaluation and creativity are not contradictory or mutually exclusive. These seeming opposites are complementary, and can beÂ achievedÂ through embedding the crystallized, higher order concepts into meaningful work. This monograph describes cognitive ethnography as a method of choice for game studies, multimedia learning, professional development, leisure studies, and activities where context is important. Cognitive ethnography is efficacious for these activities as itÂ Â assumes that human cognition adapts to its natural surroundings (Hutchins, 2010; 1995) with emphasis on analysis of activities as they happen in context; how they are represented; and how they are distributed and experienced in space. Along with this, the methodology is described for increasing construct validity (Cook and Campbell, 1979; Campbell & Stanley, 1966) and the creation of a nomological network Cronbach & Meehl (1955). This description of the methodology is contextualized with a study examining the literate practices of reluctant middle school readers playing video games (Dubbels, 2008). The study utilizes variables from empirical laboratory research on discourse processing (Zwann, Langston, & Graesser, 1996) to analyze the narrative discourse of a video game as a socio-cognitive practice (Gee, 2007; Gee, Hull, & Lankshear, 1996). Cognitive Ethnography, Methodology, Design, Game Studies, Validity, Comprehension, Discourse Processing, Reading, Literacy, Socio-Cognitive. As a methodological approach, cognitive ethnography assumes that cognition is distributed through rules, roles, language, relationships and coordinated activities, and can be embodied in artifacts and objects (Dubbels, 2008). For this reason, cognitive ethnography is an effective way to study activity systems like games, models, and simulations â€“whether mediated digitally or not. In its traditional form, ethnography often involves the researcher living in the community of study, learning the language, doing what members of the community doâ€”learning to see the world as it is seen by the natives in their cultural context, Fetterman (1998). Cognitive ethnography follows the same protocol, but its purpose is to understand cognitive process and contextâ€”examining them together, thus, eliminating the false dichotomy between psychology and anthropology. Observational techniques such as ethnography and cognitive ethnography attempt to describe and look at relations and interaction situated in the spaces where they are native. There are a number of advantages to both laboratory observation and in the wild as presented in Figure 1. As mentioned, Cognitive Ethnography can be used as an attempt to provide evidence of construct validity. This approach, developed by Cronbach & Meehl (1955), posits that a researcher should provide a theoretical framework for what is being measured, an empirical framework for how it is to be measured, and specification of the linkage between these two frameworks. The idea is to link the conceptual/theoretical with the observable and examine the extent to which a construct, such as comprehension, behaves as it was expected to within a set of related constructs. One should attempt to demonstrate convergent validity by showing that measures that are theoretically supposed to be highly interrelated are, in practice, highly interrelated, and, that measures that shouldn’t be related to each other in fact are not. This approach, the Nomological network is intended to increase construct validity, and external validity, as will be used in the example, the generalization from one study context, such as the laboratory, to another context, i.e., people, places, times.Â When we claim construct validity, we are essentially claiming that our observed pattern — how things operate in reality — corresponds with our theoretical pattern — how we think the world works.Â To do this, it is important to move outside of laboratory settings to observe the complex ways in which individuals and groups adapt to naturally occurring, culturally constituted activities. 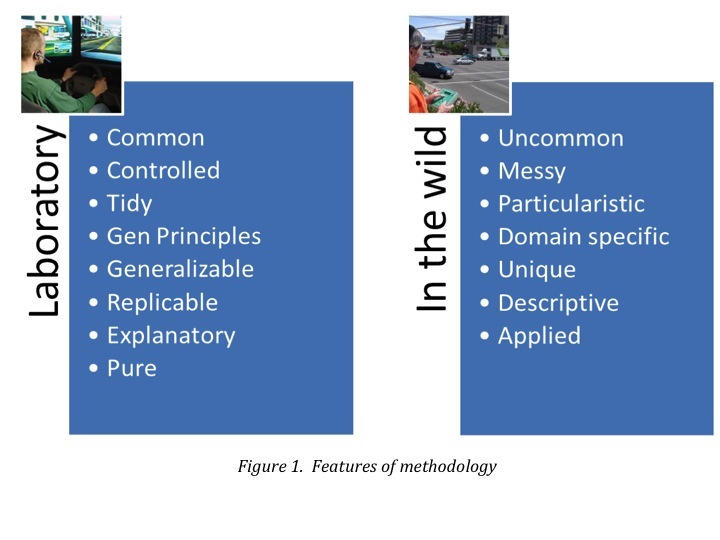 Â By extending theory building with different approaches to research questions, and move from contexts observed in the wild, then refined in the laboratory, and then used as a lens in field observation. These two approaches to research have a different purpose and approach. Most social research involves both inductive and deductive reasoning processes at some time in the project. It may be more reasonable to look at deductive/inductive approaches as a mixed, circular approach.Â Since cognition can be seen as embodied in cultural artifacts and behavior, cognitive ethnography is an apt methodology for the study of learning with games, in virtual worlds, and the study of activity systems, whether they are mediated digitally or not. 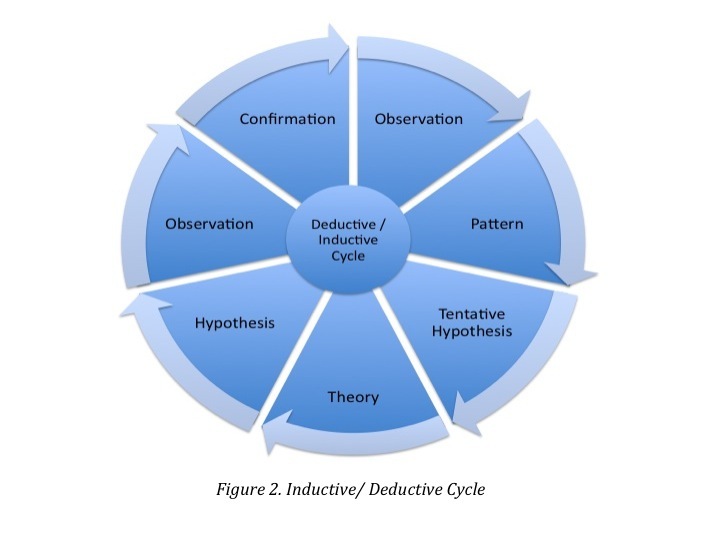 By using the deductive/inductive approach, and expanding observation, one can contrast and challenge theoretical arguments by testing in expanded context. Cognitive ethnography emphasizes inductive field observation, but also uses theory in a deductive process to analyze behavior. This approach is useful to increase external validity, operationalize terms, and develop content validity through expanding a study across new designs, across different time frames, in different programs, from different observational contexts, and with different groups (Cook and Campbell, 1979; Campbell & Stanley, 1966). More specifically, cognitive ethnography emphasizes observation and key feature analysis of space, objects, concepts, actions, tools, rules, roles, and language. Study of these features can help the researcher determine the organization, transfer, and representation of information (Hutchins, 2010; 1995). As stated, cognitive ethnography assumes that human cognition adapts to its natural surroundings. Therefore, the role of cognitive ethnographer is to transform observational data and interpretation into meaningful representations so that cognitive properties of the system become visible (Hutchins, 2010; 1995). Just as a book is organized to present information, games also structure narratives, and are themselves cultural artifacts containing representation of tools, rules, language, and context (Dubbels, 2008). This makes cognitive ethnography an apt methodology for the study of games, simulations, narrative, and human interaction in authentic context. Because this emphasis on space is also indicative of current approaches to literacy (Leander, 2002; Leander & Sheehy, 2004); as well as critical science and the studied interaction between the internal world of the self and the structures found in the world, and how we communicate about them (Soja, 1996; Lefebvre, 1994); also from the tradition of ecological views on cognitive psychological perspectives (Gibson, 1986),; and in the case of the example, Discourse Processing (Zwaan, Langston, & Graesser, 1996). Because of the emphasis in ontology and purpose of the method align so closely with the variables identified in the Discourse Processing model (Zwann, Langston, & Graesser, 1996), it was applicable as a methodological approach to create a convergence of theory and tradition predicated upon an approach that aligns in purpose with analysis and question. As an example, Dubbels (2008) used cognitive ethnography to observe video game play at an afterschool video game club. The purpose of this observation was to explore video game play as a literate practice in an authentic context.Â The cognitive ethnography methodology was recruited to utilize peer reviewed empirical research from laboratory studiesâ€”utilizing narrative discourse processing to interpret the key variablesâ€”to extend construct validity and observe whether the laboratory outcomes appeared in authentic, native contexts. This allowed the researcher to interpret observations of authentic video game play in an authentic space through the lens of empirical laboratory work at an afterschool video game club. Reading is more unlike the reading students are doing outside of school than at any point in the recent history of secondary schools, and high stakes, print-based assessments are tapping skills and strategies that are increasingly unlike those that adolescents use from day to day. These day-to-day skills and strategies were viewed as literate practice and theoretically. Can games be described as a literate practice as has been described by theoreticians? And doing analysis of interaction and behavior. Â Â Should the words behind the bullets be capitalized since you have it in sentence form? Can the literate practice of gaming be used to facilitate greater success with printed text? The hypothesis would be tested through examination of game play narratives and printed text narrativesâ€”as described in the Nomological network section; this would be an deductive/inductive process. The use of the variables from the Event Indexing Model could be used for identifying levels of discourse and the ability to create a mental representation after the inductive observation process. The hypothesis was predicated upon the theory that familiarity with patterns in text, from symbolic representations such as words, sentences, images, and story grammars. The story grammar being â€œonce upon a time,â€ in a game might be used as a developmental analog to help struggling readers predict the structure and purpose of print narratives by helping them to expect certain events, characters, and settings and help the reader to become more efficient. In essence, they would have expectations that â€œonce upon a timeâ€ leads to â€œhappily ever afterâ€, and other genre patterns attributable to transmedial narrative genre patterns. The theory is that a reader may be capable of compensation, i.e., the use genre patterns and predictive inference as higher-level process in order to support lower-level process (Stanovich, 2000). It was proposed that to develop meaningful comprehension, the propositional and situation levels might be built upon for building mental representation of printed narrative text with the game. Literate activities were codified based upon a well-established model of discourse processing, The Event Indexing Model (Zwann, Langston, & Graesser, 1996). The Event Indexing Model offered five levels of discourse processing: Surface Level, Propositional Level, Situation Level, Genre Level, and Author Communication. These levels offer an opportunity to view comprehension as a transmedial trait across discourse. The Situation Level (figure 5) is composed of two sub-levels of the variable. These are aspects of mental representation called the Dimensions of Mental Representation and are composed of: time, space, characters, causation, and goals. Â These variables of the discourse-processing model were used to code the transcripts from the game club audio/video games, and context in order to explore the familiarity the students had with patterns in discourse, and their ability to recognize and process them.Â In order to observe the literate activities of students in their chosen medium, we offered the after school game club to students who had been selected by school district professionals for reading remediation courses outside of the mainstream.Â The video game play and activity space was analyzed from direct observation and analysis of audio/video recordings and photos taken during the activity. Walkthroughs of the game were used to look at decision making through navigation of the game. A Walkthrough, according to Dubbels (in Beach, Anson, Breuch, & Swiss eds, 2009), is a document that describes how to proceed through a level or particular game challenge. Walkthroughs are created by the game developer or players and often include video, audio, text, and static imagesâ€”offering strategies, maps through levels, the locations of objects, and important and subtle elements of the game. 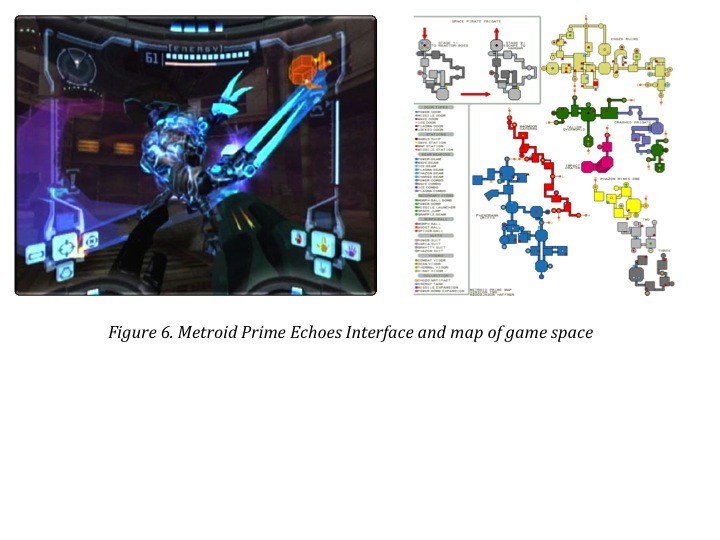 In order to have a thorough understanding of possible the goals, actions, and behaviors available in the game, a number of walkthroughs were analyzed along with the game controls, and maps for optimal playâ€”Figure 4. To create the cognitive ethnography of the video game play, two video captures were used: one to record the screen activity, and one to record player interaction with the game and play space. Because the player of the game was often highly engaged with problem solving and reacting to the game environment, there was often little-to-no dialog or variation in expression and body language â€“ however, play was often done in the company of others. This was informative as the discussion, encouragement, and advice displayed the social and cultural knowledge of the strategies of game play. In addition, a still camera was made available for the students to take pictures for their club. This included digital pictures of the games screens and each other playing, or whatever they felt was interesting. The audio and video, and still images were used for analysis of the social space, as well as the physical space. However, another level of data collection involved showing the player the video recording of their play and action in the room were used for a â€œreflect aloudâ€ (Ericsson & Simon, 1983) for them to describe their play and social interaction.Â The key feature was not only observing the play, but also identifying theories of relationships, cognition and social learningâ€”â€œwhat were you thinking there?â€ was the main question asked. This dialogue served to explain the playerâ€™s reasoning and decisionsÂ without overt interpretation by the observer. This enhanced the description, and connected the naturalistic game play to the laboratory, and then back to behavior in the wild. It was this exploration of theory that led to the study of struggling readers using video games as methods for observing levels of mental representation and recall in game play and reading. Using the Cognition Ethnographic approach allowed for comparison of students observed playing video games with friends, the dialog and behaviors that constituted game play as a literacy (Gee, 2007; Gee, Hull, & Lankshear, 1996.) and their formal academic reading behaviors. Because the boys were observed in a formal laboratory setting, it was possible to make comparisons of their game play in the informal, or wild, autonomy supporting space. And he laid the bombs on 1, 3, and 4. The boys were excited about this, as well as Dariusâ€™ willingness to show them. What was clear was that Darius had not only had played the game before, and as I questioned him more later I found that he had read about it and applied what he had read. He had performed a knowledge act demonstrating comprehension. The other boys were eager to try some of the things Darius had shown them, and Darius was happy to relinquish the controller. What happened from there was that Darius watched for a while and then walked over to the Xbox, and then to the bank of computers. I left the camera to record the boys paying Metroid Prime and I walked over to see what Darius was doing. He showed me a site on the Internet where he was reading about the game. He had gone to a fan site where another gamer had written a record of what each section of the game was like, what the challenges were, cool things to do, and cool things to find. I asked him if this was cheating; he said â€œmaybeâ€ and smiled. He said that it made the game more fun and that he could find more â€œcool stuffâ€ and it helps him to understand how to win easier and what to look for. This idea of secondary sources to better understand the game makes a lot of sense to me. It is a powerful strategy that informs comprehension as described previously in this chapter. The more prior knowledge a person has before reading or playing, the more likely they are to comprehend it fully. Secondary sources can help the player by supporting them in preconceiving the dimensions of Level 3 in the comprehension model, and with that knowledge, the player may have an understanding of what to expect, what to do, and where to focus attention for better success. Darius has clearly displayed evidence that he knows what it takes to be a competent comprehender He had clearly done the work in looking for secondary sources and was motivated to read with a specific purposeâ€”to know what games he wants to try and to be good at those games. His use of secondary sources showed that he was able to draw information from a variety of sources, synthesize them, and apply his conclusion with practice to see if it works. One of the key features of the cognitive ethnography is the realization that even the smallest of human activities are loaded with interesting cognitive phenomena. In order to do this correctly, one should choose an activity setting for observation, establish rapport, and record what is happening to stop the action for closer scrutiny. This can be done with photos, video, audio recording, and notebook.Â The key feature is event segmentation, structure in the events, and then interpretation. As was presented in the passage from Dubbels (2008), analysis was done describing the social network surrounding the game play of one boy describing the different spaces, and the behaviors of the boys surrounding him. The link to game play and strategy for successfully navigating the video game can be considered an analog to how young people read print text when a model is used as a framework for analysis. One can then connect the cultural organization with the observed processes of meaning making. This allows patterns and coherence in the data to become visible through identification of logical relations and cultural schemata. This allowed for description of engaged learning when the video students approached the game, their social relations, and how they managed the information related to success in the game, reading the directions, taking direction from others, secondary sources, and development of comprehension during discourse processing compared to the laboratory setting. In order to see if there was transfer, students were asked to work with the investigator in a one-on-one read aloud in a laboratory setting. The student was asked to read a short novel, Seed People, to the investigator for parallels and congruency between interaction of narratives found in game play, and traditional print-based narratives found in the classroom. What I noticed in talking to them about Seed People was that they would read without stopping. They would just roll right through the narrative until I would ask them to stop and tell me about what they thought was going on, with no thought of looking at the situations and events that framed each major scene, and then connecting these scenes as a coherent whole as is described earlier in the chapter as an act of effective comprehension. In one case Stephen made interesting connections between what he saw with an older boy in the story and the struggles his brother was having in real life. I just wondered if he would have made that connection if I had not stopped at the close of that event to talk about it and make connections. This ability to chunk events and make connections, as situations change and the mental representation are updated, is important for transition points in the incremental building of a comprehensive model of a story or experience. When working to teach reading with this information, it is important to connect to prior knowledge and build and compare the new information to prior situation models or prior experience. Consider a storyboard or a comic strip where each scene is defined and then the next event is framed. Readers need to learn to create these frames when comprehending text. Each event in a text should then be integrated and developed as an evolution of ideas presented as each scene builds with new information; the model is updated and expanded. In this instance with Stephen, there were many opportunities for analysis with the spaces described by Hutchins. The boy made connections to family outside of the novel, to his brother, to make it meaningful and also chunk a large section of the book as an event he could relate to. There was also the description of the setting, where Stephen was not pausing or processing the narrative in his reading. The activity did not include any social learning or modeling from friends and contemporaries, but resonated the controlled formal environment of school. Thus, it was concluded that we must build our understanding in multiple spaces. The attributes of the situation model were made much more robust and much more easily accessible when prior knowledge was recruited and connected with the familiar..
â€¢ Referent specific knowledge (pan-situational knowledge about specific entities). These two categories represent experience in the world and literary elements used in defining genre and style as described from the Event Indexing Model. The theory posits that if a reader has more experience with the world that can be tapped into, and also knowledge and experience about the structure of stories, he or she is more likely to have a deeper understanding of the passage.Â In the case of the game players, it was seen to be important for seeking secondary sources, as well as copying the modeled behavior of successful players like Darius and segmenting action into manageable events.Â This was also evident when the students were asked to read aloud print text from the Seed People novel. The students, like Stephen showed they had difficulty segmenting events, or situations, just like they had difficulty with game play. Of the fourteen regular students in the club, only two were successful with the games. After further interview and analysis, the two successful gamers, who showed awareness of game story grammar and narrative patterns were found to lack confidence in printed text. However, they were able to leverage the narrative awareness strategies from games to leverage print text form secondary sources in order to help them successfully p;ay the games. Conversely, the twelve students who struggled had to learn the help seeking strategies and narrative awareness. For this study, cognitive ethnography was an appropriate methodology as it allowed for observation and analysis of the social and cultural context to inform the cognitive approach taken by the game players. It improved external validity from the laboratory study by applying the same construct to a new time, place, group, and methodology.Â The cognitive ethnography methodology presents an opportunity to move between inductive and deductive inquiry and observation to build a Nomological network. The cognitive ethnography methodology can provide opportunity to extend laboratory findings into authentic, autonomy supporting contexts, and opportunities to understand the social and cultural behaviors that surround the activities–thus increasing generalizability.Â This opportunity to use hypothesis testing in an authentic setting can provide a more suitable methodology for usability and translation for other contexts like the classroom, professional development, product design, and leisure studies. Campbell, D.T., Stanley, J.C. (1966). Experimental and Quasi-Experimental Designs for Research. Skokie, Il: Rand McNally. Cronbach, L. and Meehl, P. (1955). Construct validity in psychological tests, Psychological Bulletin, 52, 4, 281-302. Deci, E. L., & Ryan, R.M. (1985). Intrinsic motivation and self-determination in human behavior. New York: Plenum Press. Dubbels, B.R. (2008). Video games, reading, and transmedial comprehension. In R. E. Ferdig (Ed. ),Â Handbook of research on effective electronic gaming in education. Information Science Reference. Dubbels, B.R. (2009). Analyzing purposes and engagement through think-aloud protocols in video game playing to promote literacy. Paper presented at the National Reading Conference, Orlando, FL. Ericsson, K., & Simon, H. (1993). Protocol analysis: verbal reports as data (2nd ed.). Boston: MIT Press. Gee, J. P. (2007). Good video games + good learning. New York: Peter Lang. Gee, J., Hull, G., and Lankshear, C. (1996). The new work order: Behind the language of the new capitalism. Boulder, CO: Westview. Hutchins, E. (1996). Cognition in the wild. Boston: MIT Press. Hutchins, E. (2010). Two types of cognition. Retrieved August 15, 2010, from http://hci.ucsd.edu/102b. Leander, K. (2002). Silencing in classroom interaction: Producing and relating social spaces. Discourse Processes, 34(2), 193â€“235. Leander, K., and Sheehy, M. (Eds). (2004). Spatializing literacy research and practice. New York: Peter Lang. Lefebvre, H. (1991). The production of space. Cambridge, MA: Blackwell. Soja, E. (1989). 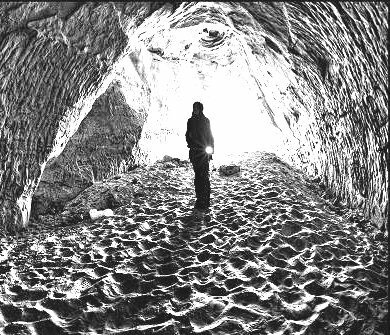 Postmodern geographies: The reassertion of space in critical social theory. London: Verso. Soja, E. (1996). Thirdspace: Journeys to Los Angeles and Other Real-and-Imagined Places. Malden, MA: Blackwell. Stanovich, K.E. (2000). Progress in understanding reading. New York: Guilford Press. Zwaan, R.A., Langston, M.C., & Graesser, A.C. (1995). 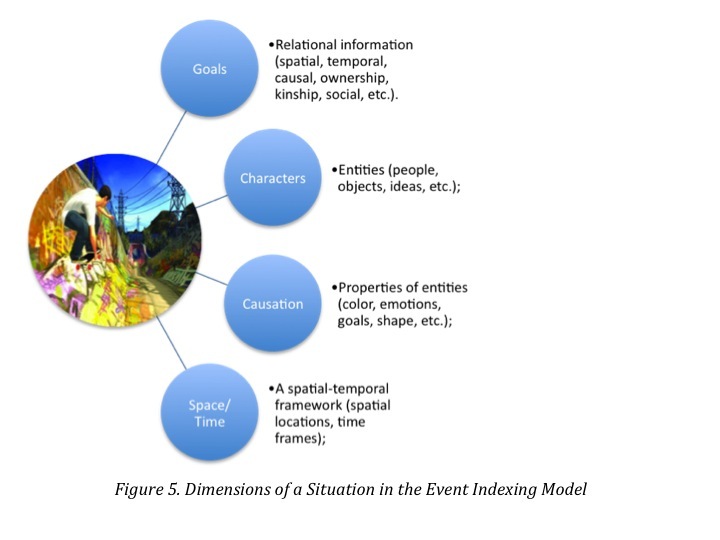 The construction of situation models in narrative comprehension: an event-indexing model. Psychological Science, 6, 292-297. Zwaan, R.A., & Radvansky, G.A. (1998). Situation models in language comprehension and memory. Psychological Bulletin, 123, 162-185. When a serious game is commissioned, it is expected that in-game learning should transfer to the work place or a clinical setting, not just lead to improvements in game play. Evidence of transfer should be a priority in serious game development; there should be evidence that learning acquired in a game is applicable outside of the game. The Vegas Effect is not unique to games; however, serious games will need to provide evidence that learning that happens in games, does not stay in games. The tradition of psychometrics may provide methods for data collection and analysis so that serious games may eventually serve as empirically validated diagnostic tools and measures of learningâ€”applicable inside and outside of the game. With tools for measuring training effectiveness from psychometrics, ROI analysis of training solutions and clinical tools can be conducted, and the risk associated with the costs of game development may be diminished. Formative assessments â€“a measurement tool used to measure growth and progress in learning and activity and can be used in games to alter subsequent learning experiences in games. Formative assessments represent a tool external to the learning activity, and typically occur in leading up to a summative evaluation. Summative assessments provide an evaluation or a final summarization of learning. Summative assessment is characterized as assessmentÂ of learning and is contrasted with formative assessment, which is assessmentÂ for learning. Summative assessments are also tools external to the learning activity, and typically occur at the end of the learning intervention to evaluate and summarize and is conducted with a tool that is external, not part of the training. An informative assessment guides and facilitates learning as part of the assessment. The assessment is the intervention. Successful participation in the learning results in evidence that learning has taken place. The behaviors in the activity have been shown to verify that learning has taken place. No external measures have been added on for assessment. Games are typically used in the definition of what is an informative assessment. This makes sense, as a game, by its very nature, provides an activity along with assessments, measures, and evaluation. What, why, and how a game measures learning is of primary importanceâ€”and this is why serious game designers must learn assessment methods from the field of psychometrics if serious games are to grow as diagnostic tools, assessments, and evaluations. If a game is to act as an informative assessment, it will stress meaningful, timely, and continuous feedback about learning concepts and process that are accurately depicted. As in an informative assessment, feedback in a game can be a powerful part of the assessment process. As the learner acts in the context of the games rule environment, they may learn the rules and tools through trial and errorâ€”eventually developing tactical approaches, and potentially formulate strategies from the possibilities for action deduced from learning from the in-game assessment criteria. This can be powerful. Evidence supports this powerful learning tool. Research findings from over 4,000 studies indicate that informative assessment has the most significant impact on achievement (Wiliam, 2007). When serious games are built with same care as an informative assessment using methods from psychometrics, serious games can be as effective as an informative assessment. Currently, most games are not designed as informative assessments. 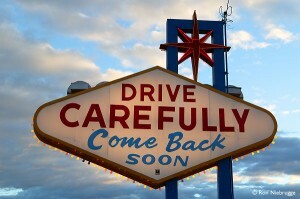 This means that learning in a serious game might suffer from the Vegas Effect. For a game to act as informative assessment, the game must accurately measure the learning the concepts, and the concepts from the game must transfer to other performance contextsâ€”beyond the game. In order to achieve this, the issue of construct validity must be addressed. External validity: the ability to generalize in-game learning to other contexts. Â To what extent can a training effect from a game beÂ generalized to other populations (population validity), other settings (ecological validity), other treatment variables, and other measurement variables? Internal validity: examines whether the adequacy of the study design, or in this case of the game, that the intervention was the only possible cause of a change in the players learning. To do this, serious game development requires valid concepts for modeling, implementation, and assessment of what is to be learned, as well as how it will be measured outside the game. This is essential for ROI (return on investment) analysis. Serious game development requires research and construct validity to conduct ROI and to avoid the Vegas Effect. Learning that happens in games should not stay in games. I have come across few if any games that have been designed with the kind of careful attention to research methodology that would be expected when measuring learning, intelligence, personality, or depression. Methods that ensure construct validity are expected in the field of psychometrics and the learning sciences, and may soon emerge as standard practice in serious game design. Games are often designed to have surface validity. This means that the gameÂ APPEARS to measure what it is supposed to measure. Surface level validity is a useful beginning, but should only be considered a step towards having a valid assessment. It should be considered a gamble to build a serious game on surface validity. Designing a serious game on surface validity increases the likelihood of the Vegas Effect. 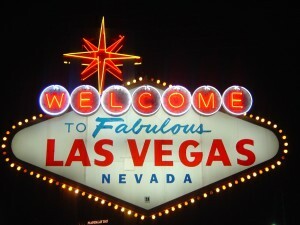 To reduce the likelihood of the Vegas Effect, a serious game designer could take their game and correlate learning outcomes with validated tools external to the serious game, such as formative and summative assessments. This method of validation is called criterion validity. To do this, the game designer might correlate success in the game with other diagnostic measures with verified content validity. For example, a claim may be made that a game improves working memory. This claim may be validated using the Dual N-Back Test for measures of working memory. The game designer might choose to have a sample of individuals take the Dual N-Back Task, play the game, and then use the Dual N-Back Task after the serious game to measure changes in working memory using the Dual N-Back Task as criterion for measuring changes in working memory. Criterion validity is a powerful way to claim effectiveness, and reduce the likelihood of a Vegas Effect. However, the research design is essential in using criterion validity. One cannot simply have someone play their serious game and then attribute changes in the Dual N-Back score by correlation with having played the serious game . . . correlation does not imply causation. To validate the serious game with improvements in working memory on the Dual N-Back Task, the serious game developer should recruit methods from psychometrics such as a Repeated Measures Design, with attention to Sampling. To really avoid the Vegas Effect, the serious game developer should adopt the gold standard:Â Construct Validity. Meaning that the learning designed into the game is measured with the same rigor as the diagnostic tools in psychometrics. Through designing games with construct validity, the game scenarios can be shown to be definitively delivering and measuring the theoretical construct.Â Although this is the gold standard, it requires significant investment in time and money to develop. 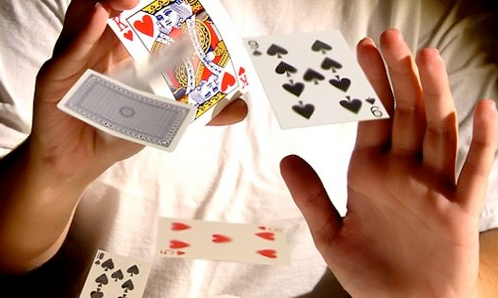 There are however, some methods from psychometrics that can be adopted in the design process of a serious game to reduce the probability of the Vegas Effect. Orientation stage- this phase is where members meet for the first time and start to get to know each other. When the expert judges the scenarios, the responses from all the judges can be gathered and inter-rater reliability can be calculated from the responses usingÂ Cohen’s Kappa. If the percentage of agreement is low, either the scale (game scenario) is defective or the raters need to be re-trained. If agreement is high, the game scenario is a step closer to construct validity. Inter-rater agreement is a simple, low-cost method for increasing assessment and content validity. This is an example of how traditional research methods from psychometrics can be integrated as part of the design process from the beginning. As suggested here, an early step in the design process is to conduct tests of inter-rater agreement. Dubbels, B.R. (in preparation) The Importance of Construct Validity in Designing Serious Games for Return on Investment. Fisher, B. A. (1970). Decision emergence: Phases in group decision making.Â Speech Monographs, 37, 53-66. BALTIMORE, MD, May 6, 2010 â€“ When children and adults with acute and chronic pain become immersed in video game action, they receive some analgesic benefit, and pain researchers presenting at the American Pain Societyâ€™s (www.ampainsoc.org) annual scientific meeting here today reported that virtual reality is proving to be effective in reducing anxiety and acute pain caused by painful medical procedures and could be useful for treating chronic pain. While moderating a symposium entitled â€œVirtual Reality and Pain Management,â€ Dr. Gold noted that the exact mechanistic/neurobiological basis responsible for the VR analgesic effect of video games is unknown, but a likely explanation is the immersive, attention-grabbing, multi-sensory and gaming nature of VR.Â These aspects of VR may produce an endogenous modulatory effect, which involves a network of higher cortical (e.g., anterior cingulate cortex) and subcortical (e.g., the amygdale, hypothalamus) regions known to be associated with attention, distraction and emotion.Â Studies measuring the benefit of virtual reality pain management, therefore, have employed experimental pain stimuli, such as thermal pain and cold pressure tests, to turn pain responses on and off as subjects participate in virtual reality experiences. examining the use of virtual reality and other computer/videogame technologies to provide distraction-based acute pain management. Children interacting with a virtual environment by watching video games demonstrated a small pain tolerance improvement during exposure to ice cold water stimulation, according to Dr. Dahlquist, but she recorded significantly greater pain tolerance for kids wearing specially-equipped video helmets when they actually interacted with the virtual environment. In one study using video helmets for virtual environment interactivity, the special equipment had little positive impact with children ages six to ten, but for those over ten years of age, â€œthere was a much longer tolerance of the pain of the cold water exposure, leading us to further study to determine what aspect or aspects of cognitive development and neurological function account for this difference among youth. 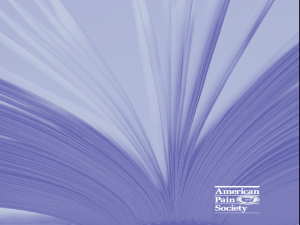 Based in Glenview, Ill., the American Pain Society (APS) is a multidisciplinary community that brings together a diverse group of scientists, clinicians and other professionals to increase the knowledge of pain and transform public policy and clinical practice to reduce pain-related suffering.Â APS was founded in 1978 with 510 charter members.Â From the outset, the group was conceived as a multidisciplinary organization.Â APS has enjoyed solid growth since its early days and today has approximately 3,200 members.Â The Board of Directors includes physicians, nurses, psychologists, basic scientists, pharmacists, policy analysts and more. From Literacy Instruction for Adolescents: Research-Based Practice. Edited by Karen D. Wood and William E. Blanton. Copyright 2009 by The Guilford Press. How can instruction in the classroom and curriculum be enhanced by using new andÂ evolving technologies that support digital literacy practices? This chapter provides an overview of evolving research and theoretical frameworks on technologies and literacy, particularly digital technologies, with implications for adolescentsâ€™ literacy engagement. We suggest future directions for engaging students with technology and provide resources that support sound practices. on technologies and literacy, and expressed optimism about the future of computers as instructional tools. In the same volume that featured the synthesis by as Kamil, Intrator, and Kim, Leu (2000) used the phrase â€œliteracy as technological deixisâ€ (p. 745) to refer to the constantly changing nature of literacy due to rapidly morphing technologies. Leuâ€™s characterization is crucial, because he posits that these literacies are moving targets, evolving too rapidly to be adequately studied. If best practices rest on a solid research foundation, then, in the case of technologies and literacy we havenâ€™t even begun to know what best practices are. Nevertheless, even in the midst of a shallow bed of â€œempiricalâ€ studiesâ€”that is, studies of specific effects, over time, with statistical power, or studies of carefully described and documented, contextualized practicesâ€”compelling frameworks have emerged, with implications for how technologies enable new literacy practices. Best practices, if based on solid frameworks rather than a carefully focused research program, can be extrapolated from the frameworks and be the basis for sound instruction and curriculum planning. In this chapter we bridge some of these frameworks with instructional practice. The relatively brief evolution of technologies and literacy has led us from computers and software as self-contained instructional platforms to a networked virtual world that computers enable. In the past 10 years or so, we have moved from viewing the Web as primarily a source of information and as a sort of dynamic hypertext with increasingly sophisticated search engines, to Web 2.0. Albeit a fuzzy term that has accrued definitions ranging from simply a new attitude about the old Web to a host of perspectives about a completely new Web, Web 2.0 presents exciting possibilities for enhancing instruction and learning. This new Web is an open environment with virtual applications; it is more dependent on people than on hardware; it more participatory than a one-sided flow of information (e.g., blogging, wikis, social networks); it is more responsive to our needs (e.g., mapping a route to a previously unknown destination). Perhaps most important, Web 2.0 is more open to sharing of ideas, media, and even computer code (Miller, 2005). The presence of Web 2.0 is about the World Wide Web (WWW) as a platform for production. Software that users would normally purchase and install from a disk or download is now hosted on the Internet. In a sense, Web 2.0 affords anyone access to the largest stage yet conceived. Educationally, it has the potential to diminish the broadcast mode of information transmission that has reduced individual interests and engagement. Instead, learners can now have at their disposal studio-quality tools that enhance production, appreciation, recognition, and performance, and above all, provide access to a worldwide audience. Whereas research on computers and reading and writing has remained sparse, research on the myriad literacy practices involved in the Web 2.0 phenomenon is sparse but growing rapidly and is informed by many theoretical frames and fields, most of which overlapâ€”for example, multiliteracies (Cope & Kalantzis, 2000; New London Group, 1996), new literacies and new literacy studies (Coiro, Knobel, Lankshear, & Leu, 2008; Kist, 2005; Knobel & Lankshear, 2007), media studies and new media studies (Hobbs, 2007; Kress, 2003), and critical media literacy and popular culture (Alvermann, Moon, & Hagood, 1999; Beach & Oâ€™Brien, 2008), to name a few. Each of these frameworks has its own dynamics for describing and studying literacy practices, and each is inextricably intertwined with other frameworks. In the rapidly emerging research base, most of the designs are highly contextualized and theoretically tantalizing, but few studies are gauged to identify specific generalizable practices. For example, the studies designed around some of the aforementioned frameworks vary in terms of methodology (spanning the full range of human and cognitive sciences); they vary in terms of which data are collected, which settings (physical and virtual) are studied, and how learners are defined (e.g., as information processors, real selves, virtual selves, identity constructors). Hence, we can present here only a small sampling and complement the descriptions with some â€œbest practiceâ€ exemplars, reminding readers of the caveat that â€œresearch-basedâ€ practices represent glimpses or snapshots taken along the rapidly moving field. What is important about technologies and literacies, especially when considering adolescents? What should we cull from the myriad evolving frameworks and perspectives to be able to present something useful for teachers and learners at this point in time given this rapidly changing texture. First, we want to present the adolescent learner, the person we call Student 2.0, starting with a vignette. High school students in Eden Prairie, Minnesota, a suburb of Minneapolis,posted photos on Facebook revealing themselves partying with alcohol, in violation of school rules. Following an investigation by school officials, disciplinary action was taken against 13 students. Students who believed that that the administration went too far walked out of school in protest; some of the parents threatened legal action (Xiong & Relerford, 2008). Scholars of digitally mediated popular culture challenged theadults, parents and school officials alike, to evaluate more critically what had happened: High school students felt a compelling need to express themselves as digital authors and document a relatively common practice, partying with alcohol. And issuing sanctions assumes that the practice had not been widespread before it was expressed publicly on Facebook. Prosecution of the rule offenders would only serve to remind the documentors to be more careful. The new media scholars also reminded the youth as authors to consider more carefully their audience in the future. When you post on Facebook, you create for everyone, including school administrators and parents. Some students who were interviewed on television reacted to the disciplinary measures by saying that their rights to free speech were violated, that the school administrators had no jurisdiction, because the activities happened off of school grounds. Others went back to Facebook to start a new group page to defend their actions. types of reading and writing they either donâ€™t engage in, or donâ€™t prefer, at school. Experienced teachers can remember when stand-alone computers were going to revolutionize education; they can recall when the Internet was a cumbersome, text-based environment rather than an engaging graphical environment called the WWW. Those of us who, as literacy educators, have spent our careers studying how young people interact with printed texts are now faced with a new landscape that renders many of our theoretical models, instructional frameworks, and â€œbestâ€ practices based on these print models inadequate or even obsolete. Print text remains important but, as noted, expression is increasingly multimodal (Kress & Van Leeuwen, 2001). Reading and writing youth are increasingly likely to express ideas using different semiotic modes, including print, visual, and audio modes, and to create hybrid texts that defy typical associations between modes and what they traditionally represent. When David worked with struggling readers in a high school Literacy Lab, the students, many of whom did not choose to read and write using print, wrote complex multimodal texts on a range of topics. They were very articulate about the affordances of various modes, and how those affordances influenced their choices in composition. For example, one group of students working a project exploring the impact of violence in the medion in adolescents, decided when to use images instead of print to communicate their ideas more effectively and passionately. They carefully planned how to juxtapose images and print to convey meaning. What would traditionally have been termed a â€œreportâ€ was instead a mul- timedia project, which they presented to parents and others at the school Open House evening. Brock has created a game studies unit, in which students study the qualities of their video games and create a technical document called a Walk- through using blogs, a wiki, video, and an animated slide show embedded into the blog. Students could read, compare, and evaluate other studentsâ€™ work. Brock used an RSS feed (really simple syndication, a feed link to syndicated content) and had the blogs collected with bloglines, a way to both aggregate the student work and provide social networking through the WWW-based platforms and the comment sections for students. with traditional spatial and temporal dimensions of schools (Leander, 2007). 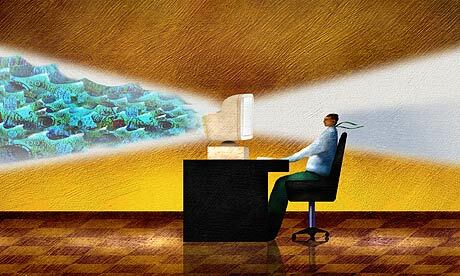 Researchers are also studying new literacy environments such as web pages using research paradigms derived from reading print on paperâ€”for example, Coiro and Doblerâ€™s (2007) work extending traditional comprehension theories to study online reading comprehension. Coiro and Dobler argue that although we know a lot about the reading strategies that skilled readers use to understand print in linear formats, we know little about the proficiencies needed to comprehend text in â€œelectronicâ€ environments. McEneaney (2006) cogently argues that the traditional theoretical frameworks, including so-called â€œinteractive theoriesâ€ (from cognitive or transactional perspectives) are too strongly based in a traditional notion of print to be useful. With what are the new literates interacting? McEneaney contends that the text can â€œact onâ€ the environment: The text can create the reader, just as the reader through the dynamics of online environments, can create or change the text. But the new literates also encounter new challenges. The new textual spatiality lacks the kinesthetic texture of books; readers lose their â€œplacesâ€ and even the ability to feel the touch of the page as they do when they flip paper pages back, then reorient themselves on the page (Evans & Po, 2007). The feel of the text is replaced by the feel of a finger on a mouse or a key. The imaging that helps a reader maintain and access the previous page might be replaced by multiple mental images of more rapidly changing texts, or mental images replaced by actual images. What Evans and Po call the fluidity of the digital or electronic texts invites readers to alter the text more readily, more easily. We come full circle with a tension faced by readers of the digital texts. On the one hand, this text fluidity begs readers to alter texts, to pick alternative texts, and to mix and match texts; on the other hand, this new textuality, with texts unfolding at every mouse click, places the text itself more in the control of the reader. The text the reader creates, often unwittingly via a series of clicks or cuts and pastes, may address the reader/writer in unexpected ways. One of the most exciting prospects for educators is the unlimited range of texts, from traditional print modes to various hybrids, including print texts, visual texts, audio texts, and even various types of performance texts that students can now create, as they themselves are â€œcreatedâ€ or changed by those texts. The new literates can navigate through a collage of print, images, videos, and sounds, choosing and juxtaposing modalities, and bending old spatial and temporal constraints to communicate to peers and to others throughout the world. directed interpretation of images. As educators, we have to concede that texts are increasingly multimodal (Jewitt & Kress, 2003). In multimodal reading and composing, ideas and concepts are represented with print texts, visual texts (photographs, video, animations), audio texts (music, audio narration, sound effects), and even dramatic or other artistic performances (drama, dance, spoken-word) (Oâ€™Brien & Scharber, 2008). A second change is the increasing popularity of hybrid texts that are unlike most of the longer, connected discourse with which many of us grew up. For example, textoids are on the rise. These texts were originally defined as specially created research texts that lacked the coherence and structure of naturally occurring texts from typical genres (Graesser, Millis, & Zwaan, 1997) or contrived instructional texts (Pearson, 2004). Ironically, these once- contrived texts are ubiquitous in online environments. The term textoids now refers to fleeting texts that are transported from one place to another and are constantly changing (e.g., Wikipedia entries, pasted into a studentâ€™s report and edited to fit into the new textual context); they are also textual bursts of information sent to cell phones as text messages. Short textoids or text bursts are displacing longer discourse as readers expect more choices in accessing information and entertainment faster in quick clicks. At the same time, the sheer number and range of genres of these textoids, the juxtaposition of textoids with other media, and the retention of the more traditional, longer discourse, makes reading in online text environments more challenging than reading in traditional print environments. spatial (hypertexts, hypermedia). Single textoids or pages or articles are linear, but they exist in virtual space, with a multitude of other possible texts. In short, the texts have virtual structure that is much more dynamic than static structures assigned to single print texts. part of young peopleâ€™s daily lives. In addition, the personal electronics that many young people carry in their pockets, backpacks, and purses are more powerful than the computers that inhabited labs not even 5 years ago. With the advent of new applications and relatively cheap storage on the Web, these portable devices neither perform the bulk of processing nor store the outputs of processing; they are access devicesâ€”Web portals, with small screens and keyboards or other ways to input data. For example if you want to work with pictures, you can access a portal such as Flickr to view and manage pictures; if you want to create a document of just about any stripe, you can go to Google Docs and make slide shows; engage in word processing; construct spreadsheets; and store, share, and collaborate with writing partners. able to draw from existing content domains, themes, and conceptual frameworks as they work within the applications; the tools can provide supportive environments for producing content, sharing and collaborating around content, and hosting public displays of usersâ€™ productions. Hence, the tools are not useful without the context of a larger unit or lesson plan, and instructional and learning frameworks that support activities and literate practices enabled by the tools. Teachers must understand clearly their instructional and learning objectives and goals, and students must know how the tools can help them meet those goals. Otherwise, the tools, which students sometimesknow well and can use for entertainment, revert to usersâ€™ tools for pleasure and interests, easily circumventing instructional or learning practices desired by teachers. Next, we review some Web 2.0 tools that enable these practices, and describe the features of each, presenting examples of how we have used them with students. public address system, students often checked their MySpace pages. Although the site was blocked in the district, many students easily overcame the obstacle by searching for a proxy server that granted them access. A proxy server is a website that has a name accepted by the firewall, so it is allowedâ€”it is kind of like using a fake ID. Although students may not know how it works, they have learned how to do it. And no matter how savvy the information technology (IT) department, the almost infinite supply of new proxy servers and webpages, with directions targeting youth who want to jump the school restrictions, makes sites deemed objectionable by school districts difficult to block. On the one hand, to the digital immigrants and the inhabitants of the Institution of Old Learning (Oâ€™Brien & Bauer, 2005), MySpace represents an uncontrolled virtual space that distracts students from work and enables socializing and forms of expression incompatible with the organization and temporal control of school. On the other hand, for digital natives, â€œassimilatedâ€ digital immigrants, and new literacies advocates, MySpace is a dynamic forum of multimodal expression. It is also a place where young people socialize with peers around the world, put pictures up, write in slang, stream music and video, and engage in instant messaging. They are able to blog, to embed flash animationsâ€”in short, to engage in almost limitless expression using a range of multimodal literacies. It is really an example of students expressing themselves in the same way they dress, decorate their rooms, or draw in their notebooks. This does not mean that the space is benign. Although you can connect with friends and family, you can also get solicitations from unwanted characters. Most young people are aware of whom to talk to, and how they expect others to speak to them. Users know that others mask their true identities through the computer, which has led young people to be more savvy as well. The Kaiser Family Foundation Generation M report (Roberts, Rideout, & Foehr, 2005) notes that when kids come across inappropriate sites and solicitations, they move past them. For digital natives, experienced in social networking, these are just another distraction in the way of what they went to the site to do. MySpace sites can also be locked to persons other than those invited by the owner. We donâ€™t expect sites like MySpace to be imported into the school curriculum. However, in the spirit of being more assimilated into Generation Mâ€™s world, it makes sense for teachers to join MySpace, set up a page, and even let students know that you have done so. As teachers, we interact regularly with our students via MySpace. Through it, we are more in tune with their social worlds, their interests, and their creativity. You might also want to bridge media production in school with the sharing features of such social networking sites, so that students may use tools like MySpace as a way to share and to get feedback on their productions. You already know a bit about Facebook from the Eden Prairie vignette. It is a place where you can post your profile and surround yourself with friends, their activities (including photos of parties!) and favorite sites, and connect the dots to all of your websites. Brock has links to SlideShare, mogulus television station, Facebook social networking groups, and various blogs. Facebook also includes tons of little games, multiple ways you can communicate with others, and things you can share. Brock is a member of many groups, and when the mood catches him, he starts another group: How about people who have read this chapter and want to continue the discussion about literacies involved in applications for Student 2.0? It really is that easy, and he really did start that group. keep up to date with friends through instant messaging, and be alerted to activities of groups to which you belong. Facebook, like MySpace, is blocked in many school districts, although most of adolescents we know seem to prefer MySpace. As with MySpace, we encourage teachers to set up a Facebook account to see what it provides. Although it might be tricky if the site is officially blocked in school, we also encourage teachers to use it to network with both colleagues and students. One of the great revelations, if you are included as a â€œfriendâ€ to students classified as â€œstrugglingâ€ in reading and writing, is the quality, the range of genres, and the passion with which these students compose and engage in reading othersâ€™ compositions on social networking sites. It is possible that these same students, who have negative perceptions about their abilities and avoid reading and writing in school, might invite teachers to read what they have written online. ï»¿1. To show a video. 2. To host a video we have produced. 3. To engage in social networking. 4. To enhance engagement among students. This photo sharing website, web services suite, and online community platform was one of the earliest Web 2.0 applications. In addition to being a popular website for sharing personal photographs, the service is widely used by bloggers as a photo repository. Flickrâ€™s popularity has been fueled by its innovative online community tools that allow photos to be tagged and browsed by folksonomic means, a social/collaborative way to create and manage tags for content, in contrast to traditional subject indexing, in which content is fit to subjects predetermined by experts (Vander Wal, 2007). In Flickr, metadata are generated by not only experts but also creators and consumers of the content. Folksonomies became popular on the Web around 2004, with social software applications such as social bookmarking or annotating photographs. Typically, folksonomies are Internet-based, although they are also used in other contexts. Folksonomic tagging is intended to make a body of information increasingly easy to search, discover, and navigate over time. As folksonomies develop in Internet-mediated social environments, users can discover who created a given folksonomy tag, and see the other tags that this person created. In this way, a folksonomy user may discover the tag sets of another user who similarly interprets and tags content. The result is often an immediate and rewarding gain in the userâ€™s capacity to find related content (a practice known as pivot browsing). Part of the appeal of folksonomy is its inherent subversiveness: Compared to the choice of the search tools that websites provide, folksonomies can be seen as a rejection of the search engine status quo in favor of tools that are created by the community. Obviously, in addition to being a place to share photos, Flickr is a great source of media form studentsâ€™ multimedia productions. This Web application is great for getting students to see the opportunities of creating active multimedia products. Brockâ€™s students created slide shows in PowerPoint, using images, text, and animation and transition effects, then uploaded them to SlideShare. This allowed the class to create their own group (Washburn Introduction to Engineering Design [IED]) where they could see and comment on each othersâ€™ slides, as well as use the chat function. Students also use SlideCast, in which they enter and synchronize an MP3 with their presentation, so that both teachers and students can create music videos or even do voice-over narration for telling stories and performance (dramatic) readings. SlideShare also lets you one-click to Blogger, so that students may embed their slide show in their blog. A cool feature is the ability to link this into Facebook. Google provides a nice suite of tools for educators and students. Often your students have computers with Internet access at home but lack productivity software, such as Microsoft Office, or free tools such as OpenOffice. Students can use the Google Suite to create word processing, slide shows, and spreadsheets. The impressive feature is that this suite is available online, so students with an Internet connection can work at home on the document they created at school. And as with other Web 2.0 applications, students may invite others to cowrite and produce documents here. This allows groups to work on the same paper, and it also tracks each personâ€™s contributions as the document is created. We used Google Documents to collaborate on this chapter. In addition, Google Maps, Google Earth, and Google SketchUp, a three-dimensional modeling program, are other tools in the Google suite that deserve extra emphasis. Reading and writing practices are more engaging to students when tied to the creation of the places, people, and activities. Brock had students create scenes from the play A Raisin in the Sun using this tool. The class explored the role of place and lived space, and the way space influences how people feel, speak, and act. This high-tech diorama was reminiscent of the shoebox versions we sometimes made for fun or for school projects. Web browser, it can effortlessly transmit information to, and receive information from, other Web services and applications; because it runs on oneâ€™s personal computer, it can also communicate with software running there (e.g., Microsoft Word). It can also be used offline (e.g., on a plane, in an archive without Wi-Fi). upload as many documents as you like. Once these are up, they are also available for fast indexing by Google and other major search engines, so that your content can be found in simple searches. You can keep certain documents private or share with a limited number of friends, and you can automatically convert published content into PDF, Word, and plain text. What is engaging for young writers is that not only can they publish widely but they also can see how many people have viewed their documents by location. Through Google you find documents similar to your own, as well as connect with a community of writers working in the same content area, enabling feedback and dialogue about your documents yet allowing you to retain full copyright under Creative Commons licenses. ï»¿â€¢ Digg. A community-based, popular news article website, where newsÂ stories and websites are submitted by users, then promoted to the front page through a user-based ranking system. â€¢ bubbl.us. An online brainstorming tool that students and teachers can use to create colorful mind maps online, share maps and collaborate with friends, embed mind maps in blogs or websites, e-mail and print maps, andÂ save maps as images. â€¢ BigHugeLabs.com. A tool that makes using Flickr a lot more interestingÂ by capitalizing on the siteâ€™s existing functionality. Dozens of toys, games, and utilities allow you, for example, to create a magazine cover from a selected Flickr photo, create a motivational poster, and access huge amounts of user Â Â Â data (FlickrDNA). ï»¿â€¢ Photoshop Express. An application providing two gigabytes of storage to which you can link in your blogs or websites. You can edit images on the fly without having to up/download them each time or move from computer toÂ computer, and you are just a login away from your library of photos. â€¢ SoundJunction. A site where users can take music apart and find outÂ how it works, create music, find out how other people make and perform music, learn about musical instruments, and look at the backgrounds of different musical styles. â€¢ del.icio.us. (pronounced like the word delicious). A social bookmarking Web service for storing and sharing data with more than 3 million users and 100 million bookmarked URLs. â€¢ Ning. A site that enables the creation of oneâ€™s own social network, designed to compete with sites like MySpace and Facebook, by appealing toÂ users who want to create networks around specific interests, or who have limited technical skills. â€¢ VoiceThread. A versatile online media album that can hold essentially any type of media (images, documents, and videos) and allow people toÂ make comments in five different waysâ€”using voice (with a microphone or telephone), text, audio file, or video (with a webcam)â€”and share them withÂ anyone they wish. â€¢ Many Eyes. A tool for the visual representation of data that makes sharing data creative and fun, while tuning students into the relation between information presentation and interpretation. â€¢ Scratch. A designing tool with a language that makes it easy to createÂ interactive stories, animations, games, music, and art. the Scholastic READ 180 program, read and discuss young adult novels as a group, and dramatize the texts and a range of activities to integrate reading and writing. They also engage in strategies instruction, such as the use of mind mapping and various activities designed specifically to help students achieve competence on state language arts standards and high-stakes assessments. On the new literacies side, using various technology tools, the students engage in writing activities, such as producing stories, comic books (using Comic Life), wikis (in Moodle) and poetry writing. They write journal responses to their reading and construct PowerPoint presentations about topics, such as their favorite video games or young adult novels, and share their poetry or story writing. They plan, design, and perform radio plays (using GarageBand for background tracks and sound effects). Recently, students completed placebased projects in which they used VoiceThread to publish photos of important places in their school, complete with audio or print commentaries. They publish their writing in the school district Moodle site. Some of the students also participate in afterschool computer gaming sessions. In the new literacies realm, the teachers include practices in which students engage to explore ideas, construct a classroom community, and develop agency in meeting personally relevant goals. This was the first unit that Brock created after transitioning from a language arts teacher to a media specialist. He found that the units he taught as a language arts teacher were still very applicable to the standards and benchmarks in media technologies when it came to teaching media or print texts, or the many opportunities that arise as a result of having access to computers. As a media specialist, Brock tried to link the media and technology activities to improvement in reading and writing. For example, he included Reading Friday, in which students had to create a music business persona/image, describe their style of music, and choose lyrics that they would perform and record into Garage Band. GarageBand is one option. Students could also use one of the Web-based products we have discussed. So the students took print textsâ€”poems, paragraphs, dialogue, and lyrics they likedâ€”and recorded themselves reading as a track on the music software. They also recorded outtakes, or descriptions of the experiences, and rated their oral interpretation performances. After students had shared their tracks with Brock, they began to practice putting a beat and music behind the tracks. This enabled a thorough interpretation and exploration of voice and oral expression. Students who had never really thought about the qualities of the voices in the narratives (e.g., the tone, theme, pitch, volume, emphasis in elongation and breaks) could better hear and understand dramatic pauses, tone and volume changes, diction and word choices, as well as format, organization, and punctuation. This activity began to make a difference in studentsâ€™ understanding of these concepts. As students began exploring pauses work, changing and emphasizing words, assonance, and resonance in rhyme structures, they were really looking at oral reading and fluency, and reading in general, in a much deeper and more playful way. Students then took photos and made their CD covers, using image manipulation software; they made their own liner notes and wrote their own copy for advertising; they conceptualized a MySpace design (because they were not permitted access to MySpace) and created tours, clothing, and so on. It turned into a game about being in the music business. This unit, which had originally been intended as a week-long reward for the kids, so engaged students as they performed their lyrics and created their music careers that Brock extended it for 2 weeks. more effective ways to engage students. Second, best practices dictate that the technologies enhance teaching and learning by providing access to media and enabling students to use various modalities to explore and publish ideas. Third, although we can already see a future in which digital literacies replace traditional print literacies, for now, given the realities of standards, print-centric assessments, and, particularly the predominately print-based curricula, best practices explore ways to bridge print and digital literacies effectively. Fourth, the notion of best practices, which we typically associate with teaching or facilitating learning, should be extended to include practices related to supporting infrastructures and increasing funding for technologies that do enhance teaching and learning. Clearly, the future will bring a wider range of more accessible digital tools. What started as the Web 2.0 phenomenon will continue at a rapid rate as the analog television bandwidth is purchased by Web Portals, such as Google, to provide faster access to more and more data from small personal communication devicesâ€”things that we used to call â€œphones.â€ As shown by current studies from the Pew Internet and American Life project, youth will continue to use more media and engage in more media multitasking or multimediating. As more young people have access to these tools, the digital divide will persist but not be as defined. As educators, we will slowly but surely start to redefine learners based on the experiences these young people have daily in the mediasphere, and the way their brains are changing as result. Similarly, we will start to redefine literacy more in line with the new literacies practices in which youth engage outside of school, and to think of better ways to connect out-of- school and in-school experiences with technologies and literacy. that improve intertextual, intermedial, and multimodal understanding? We briefly outline some of these realizing that practices, they are morphing as we write, and that new ones will have emerged even before this chapter is published. We offer these not so much as static examples but as ways of thinking about best practices in the milieu of new and emerging technologies, and new literacies and literates. We want fellow educators to think in novel ways about how these new technologies may improve literacy practices, not because of their technical features, but because they are engaging. Although it is over simplistic to state that technologies are worthwhile simply because they are motivating, we might cautiously state that technologies are engaging because they often incorporate aspects of play, are pleasurable, and are associated with leisure time outside of school. We also argue that good technology can guide and extend studentsâ€™ knowledge of the world and their relationship to it, and that the software and appliances it inhabits are means for guidance, creativity, and production. Here are some recommended practices as we to end this decade and head into the next. Young people should have access to curricula and learning opportunities in which reading and writing strategies instruction is not always the focus; rather the focus is to provide high-interest engaging activities that allow young people to accomplish goals using a range literacy tools and practices, many of them enabled by technology. Young people can become very strategic about what tools they use and how they use them to engage in practices that produce personally relevant outcomes. Learners need to be strategic, but they do not always benefit most from being taught strategies. And, as we noted, it is quite possible that the learners we are trying to engage are harder to engage because of their experiences in the mediashpere. In Brockâ€™s teaching, texts arenâ€™t necessarily print texts; rather, they are multimodal messages (Dubbels, 2008). For example, Brock has even used allegorical paintings and text as movement activities and multimodal analogues to decoding and propositional levels of comprehension. learning, and to connect the learning to personally relevant goals. options for existing tasks and assignments (e.g., a media inquiry project in place of a report; a blog in place of a term paper), and to provide for students a choice in the modalities and tools they use. David and his colleagues did just this in the Literacy Lab at Jeff High School (Oâ€™Brien, 2006; Oâ€™Brien, Springs, & Stith, 2001) when they reconstructed an entire literacy curriculum to take advantage of a multimedia lab they set up. immersion is that teachers who use the technologies can understand how these tools enable teaching and learning; the more affective dimension is that the actualizing digital immigrants see the value of the tools and feel good about their own competence in using them. York: Teachers College Press. Available online at teachingmedialiteracy.com. in new literacies. New York: Erlbaum. intelligent technology integration into the English language arts. the use of technologies and literacy. Alvermann, D. E., Moon, J. S., & Hagood, M. C. (1999). Popular culture in the classroom: Teaching and researching critical media literacy. Newark, DE: International Reading Association. Beach, R., & Oâ€™Brien, D. G. (2008). Teaching popular culture texts in the classroom. In J. Coiro, M. Knobel, C. Lankshear, & D. Leu (Eds. ), Handbook of research on new literacies (pp. 775â€“804). New York: Erlbaum. Clark, A. (2003). Natural born cyborgs? In J. Brockman (Ed. ), The new humanists (pp. 70â€“77). New York: Barnes & Noble. Coiro, J., & Dobler, E. (2007). Exploring the online reading comprehension strategies used by sixth-grade skilled readers to search for and locate information on the Internet. Reading Research Quarterly, 42(2), 214â€“257. Coiro, J., Knobel, M., Lankshear, C., & Leu, D. J. (Eds.). (2008). The handbook of research on new literacies. New York: Lawrence Erlbaum. Cope, B., & Kalantzis, M. (Eds.). (2000). Multiliteracies: Literacy learning and the design of social futures. London: Routledge. Dubbels, B. R. (2008). Video games, reading and transmedial comprehension. In R. E. Ferdig (Ed. ), Handbook of research on effective electronic gaming in education (pp. 251â€“276). Hershey, PA: IGI Global. Evans, E., & Po, J. (2007). A break in the transaction: Examining studentsâ€™ responses to digital texts. Computers and Composition, 24, 56â€“73. Foehr, U. G. (2006). Media multitasking among American youth: Prevalence, predictors, and pairings. Menlo Park, CA: Henry J. Kaiser Family Foundation. Graesser, A. C., Millis, K. K., & Zwaam, R. A. (1997). Discourse comprehension. Annual Review of Psychology, 48, 163â€“189. Hague, S. A., & Mason, G. E. (1986). Using the computerâ€™s readability measure to teach students to revise their writing. Journal of Reading, 30(1), 14â€“17. Hobbs, R. (2007). Reading the media: Media literacy and high school English. New York: Teachers College Press. Jewitt, C., & Kress, G. (Eds.). (2003). Multimodal literacy. New York: Peter Lang. Kamil, M. L. (1982). Technology and reading: A review of research and instruction. In J. A. Niles & L. Harris (Eds. ), New inquiries in reading research and instruction. Thirty-first yearbook of the National Reading Conference (pp. 251â€“260). Rochester, NY: National Reading Conference. Handbook of reading research (Vol. 3, pp. 773â€“788). Mahwah, NJ: Erlbaum. Kist, W. (2005). New literacies in action: Teaching and learning in multiple media. New York: Teachers College Press. Knobel, M., & Lankshear, C. (Eds.). (2007). A new literacies sampler. New York: Peter Lang. Kress, G. (2003). Literacy in the new media age. London, UK: Routledge. Kress, G., & Van Leeuwen, T. (2001). Multimodal discourse: The modes and media of contemporary communication. London: Edward Arnold. Lankshear, C., & Knobel, M. (2003). New literacies: Changing knowledge and classroom learning. Buckingham, UK: Open University Press. Leander, K. M. (2007). â€œYou wonâ€™t be needing your laptops todayâ€: Wired bodies in the wireless classroom. In M. Knobel & C. Lankshear (Eds. ), A new literacies sampler (pp. 25â€“48). New York: Peter Lang. Lenhart, A., Madden, M., Macgill, A. R., & Smith, A. (2007). The use of social mediaâ€” from blogging to online social networking to creation of all kinds of digital materialâ€”is central to many teenagersâ€™ lives. Washington, DC: Pew Internet and American Life Project. Leu, D. J. (2000). Literacy and technology: Deictic consequences for literacy education in an information age. In M. L. Kamil, P. Mosenthal, P. D. Pearson, & R.
Barr (Eds. ), Handbook of reading research (Vol. III, pp. 743â€“788). Mahwah, NJ: Erlbaum. McEneaney, J. E. (2006). Agent-based literacy theory. Reading Research Quarterly, 41(3), 352â€“371. Miller, P. (2005). Web 2.0: Building the new library. Ariadne, 45. New London Group. (1996). A pedagogy of multiliteracies: Designing social futures. Harvard Educational Review, 66(1), 60â€“92. Oâ€™Brien, D., Beach, R., & Scharber, C. (2007). â€œStrugglingâ€ middle schoolers: Engagement and literate competence in a reading writing intervention class. Reading Psychology, 28(1), 51â€“73. Oâ€™Brien, D., & Scharber, C. (2008). Digital literacies go to school: Potholes and possibilities. Journal of Adolescent & Adult Literacy, 52(1), 66â€“68. K. A. Hinchman, D. W. Moore, S. F. Phelps, & D. R. Waff (Eds. ), Reconceptualizing the literacies in adolescentsâ€™ lives (pp. 29â€“46). Mahwah, NJ: Erlbaum. Oâ€™Brien, D. G., & Bauer, E. (2005). New literacies and the institution of old learning. Reading Research Quarterly, 40, 120â€“131. Oâ€™Brien, D. G., Springs, R., & Stith, D. (2001). Engaging at-risk students: Literacy learning in a high school literacy lab. In E. B. Moje & D. G. Oâ€™Brien (Eds. ), Constructions of literacy: Studies of teaching and learning in and out of secondary schools (pp. 105â€“123). Mahwah, NJ: Erlbaum. Pearson, P. D. (2004). The reading wars. Educational Policy, 18(1), 216â€“252. Prensky, M. (2001). Digital natives, digital immigrants. On the Horizon, 9(5). Accessed April 1, 2008, from www.marcprensky.com/writing/Prensky%20-%20digital%20 natives,%20digital%20immigrants%20-%20part1.pdf. Reinking, D., McKenna, M., Labbo, L., & Kieffer, R. (Eds.). (1998). Handbook of literacy and technology: Transformations in a post-typographic world. Mahwah, NJ: Erlbaum. Restak, R. (2003). 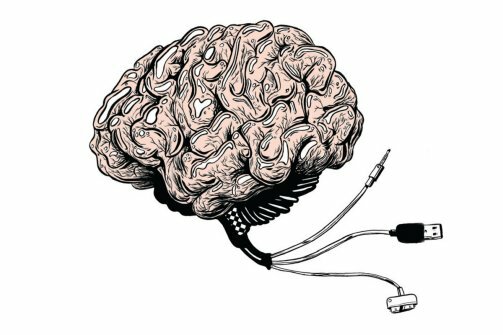 The new brain: How the modern age is rewiring your mind. New York: Rodale. Roberts, D. F., Foehr, U. G., & Rideout, V. J. (2005). Generation M: Media in the lives of 8â€“18 year-olds. Menlo Park, CA: Kaiser Family Foundation. Vander Wal, T. (2007). Folksonomy Coinage and Definition. Retrieved October 26, 2007, from www.vanderwal.net/folksonomy.html. Xiong, C., & Relerford, P. (2008, January 13). A minor walkout in Facebook flap. Minneapolis Star Tribune. Accessed October 24, 2008, at www.startribune.com/local/ west/13677002.html. The Jekyll and Hyde Effect — Play, Games, and Learning in the classroom Professional identities torn asunder? 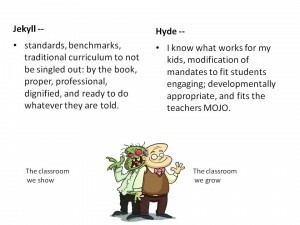 The Jekyll and Hyde Effect calls into question approaches to accountability and implementation of mandated approaches to research-validated techniques and assessment in classroom instruction. 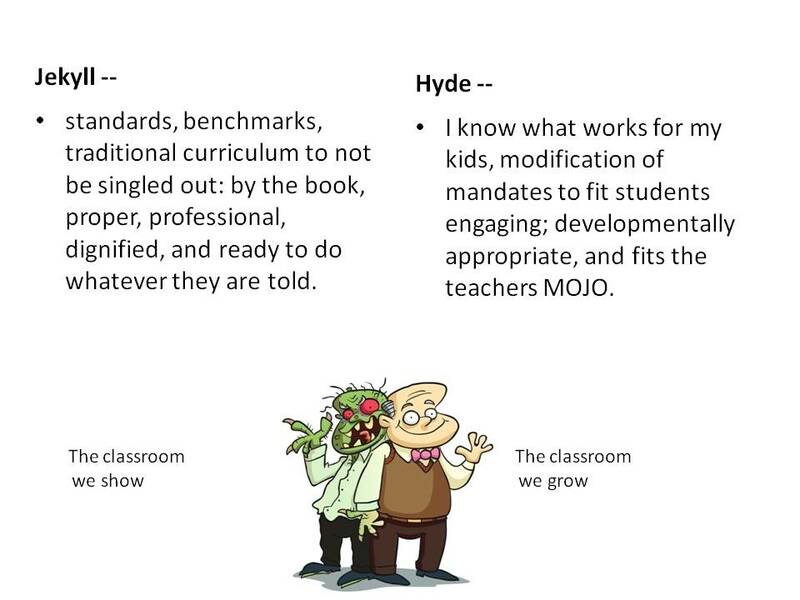 Dissonance between teachers core beliefs about student learning and these new mandates, as presented to them, may be creating two different identities, two different classrooms, and two different sets of booksÂ to satisfy mandates and continue doing what they know works. This study utilized discourse analysis, coding teacher artifacts as outcomes of genre chains with themes from mandates, policy, and law for classroom changes in curriculum and instructional assessment tools, materials, and professional development. The informants from the studies and findings from analysis of the artifacts reveal that many teachers do not feel that what is good for the spreadsheet is good for kids. This tension in core beliefs about learning and instruction need not lead to conflict– integration of assessment and appropriate implementation could enhance teacher and student experience. The transformation of policy to implementation was seen as problematic and led to misunderstanding and conflict, often based upon an inability to see standards, benchmarks, and assessments integrated into engaging, play-like activities such as games rather than the controlled, direct instruction that might cause resistance and disinterest by students and instructors, but easy to identify by administrators. The presentation makes a case for the importance of play in engagement and comprehension through review of literature on intelligence measures and new research on embodiment theory and the indexical hypothesis. Then it give examples of implementation. New models of comprehension and memory validate the value of active and playful learning for cognitive enhancement and generative transfer. Data on academic performance and engagement measures from five years of games, play, and virtual space learning in K-20 classrooms will be presented in the context of assessment measures using a model for assessing cognitive growth. 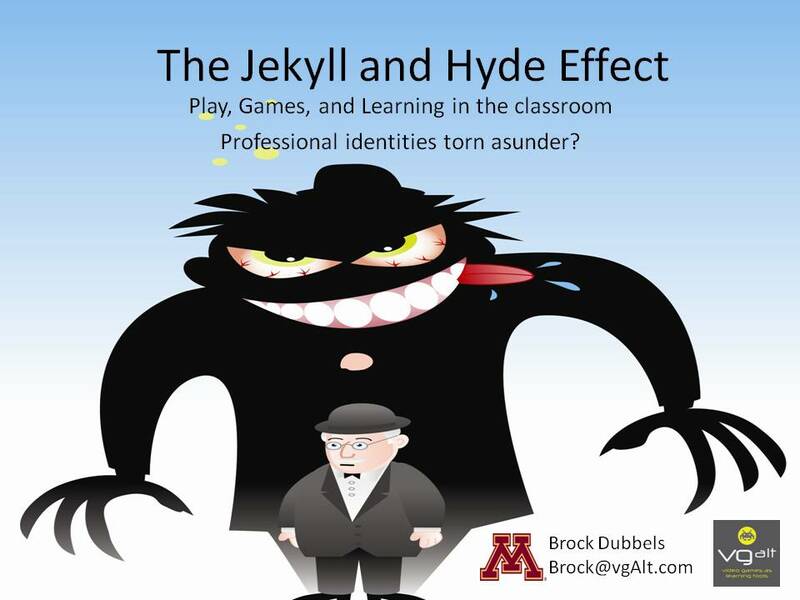 This is contrasted with educator beliefs, the efficacy of play, and the limitations of models of teacher professionalism creating a Jekyll and Hyde Effect. Though interviews, artifacts, and surveys, K-20 educators have expressed a willingness to embrace games, but have been reluctant to do so publicly for fear of professional reputation, as well as the ability to implement such pedagogical change. In this presentation, on overview of research, methodology, outcomes, and descriptions of implementation will be presented on how video games and virtual worlds were used to raise standardized reading scores. This evidence, methodology, and experience is presented with outcomes of surveys, interviews, and discourse analysis of teacher artifacts, and presents the institutional experiences of educators balancing the tension of using games and play, and the fear of being stigmatized as unprofessional at their teaching sites. The result begins to create a picture of creating two different sets of books, and two different teaching identities — Jeckyll and Hyde. View more presentations from brock.dubbels. By now, you’ve probably heard about the National Gallery of Writing that NCTE is building online by inviting people to select and post one thing they have written that is important to them. Anyone can share any composition. It can be any formatâ€”from word processing to photography, audio recording to text messagesâ€”and any type of writingâ€”from letters to lists, memoirs to memos. Over a three-week period, the kids split up into groups and play video games. They also take notes. The goal is to explain how the game is played, how a player might win and how the game is designed. By the end of the session, the students will have created a multimedia presentation, including lots of writing, about their games that is then uploaded to the Web. Students at Seward Montessori and their teacher Brock Dubbels describe the fun and engagement that are part of this video game unit, but there’s more than just fun going on. Jess Sanchez, one of the students, explains that he likes “learning how the games can help you in the future and how they’re made, instead of just playing them. . . . . It makes me think of them in a different way.” Could a teacher ask for a better recognition of the critical thinking behind a classroom activity? Dubbels has designed a great assignment, and what makes it work is that underneath it adheres to the basic principles outlined in the NCTE Beliefs about the Teaching of Writing. The students in the middle school class are positioned as authorities in an authentic research project. Their project is personally relevant, and they have a real audience of peers who want to hear what they have to say. The presentations students publish at the end of the unit are precisely the kind of work that belongs in the National Gallery of Writing. So why do I want to see those presentations in the Gallery? The Gallery invitation asks writers to share one piece of writing, anything that they “deem important or significant.” Those multimedia presentations are perfect because, in them, the writers are exploring something that they know and care about. The presentations are “important or significant” because they matter to the people who wrote them. That’s the kind of writing I hope people will shareâ€”and the kind of writing I hope all teachers will encourage others to submit. Do your part. Register a local gallery in the National Gallery of Writing today, and make plans to submit your own writing and to encourage students, families, colleagues, local community members, and even your state and federal politicians to do the same. I want to see compositions that you really care about in the Gallery when it opens in October! as well as receive other site updates!